We clean sofas, armchairs, chairs, mattresses, carpets and other upholstered furniture. We get rid of dust, dirt, dust mites and their excretions. Calculate your estimated price. You should know: The minimum order price including transport is 25 Euros. We clean offices, restaurants, cafés, casinos, shops, schools and more. Read more about this service. 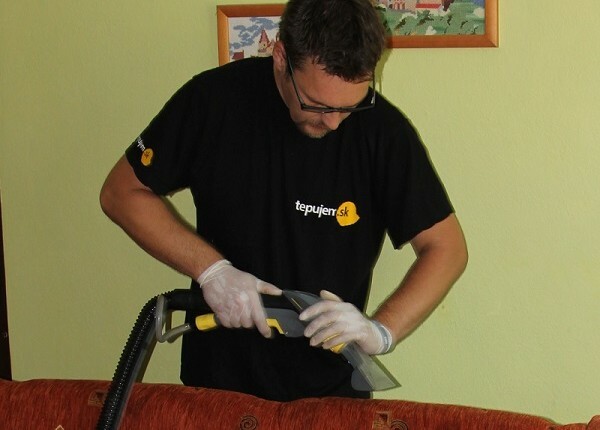 You should know: Wet cleaning of normally dirty carpets starts from 1 Euro / m2. Professional carpet shampooing machine hire for eight hours, including wet cleaning liquid preparation for the cleaning of the entire house. Read more about this service. You should know: Wet cleaning machine hire price is 23 Euros in case when you come to take the machine and bring it back personally. Otherwise we calculate the price of transport. We do disinfection of housing, offices and cars with the help of ozone generator. Learn more about ozone disinfection. You should know: Ozone Disinfection costs 15 Euros, households 0.35 Euros / m3. Calculate the price of household cleaning m2 x height x 0.35 Eur. We clean and impregnate leather sofas and chairs. You should know: The price of leather sofa cleaning is 10 Euros / sofa. Sofas are cleaned manually and the average time is three hours. We also clean leatherette sofas and armchairs. You should know: The price is in this case determined according to agreement. We provide machine-effective cleaning of tiles and their polishing and waxing. You should know: Price of tile cleaning costs 0.80 Euro/ m2. We do this type of cleaning directly at the client´s – mobile cleaning of vehicles. In case when this is not possible, we will do the cleaning in our open air space when the weather is good. In case of various accidents such as flooding onto the carpet, tiles or wet walls we offer moisture extraction and drying of walls by professional industrial dryer. You should know: Price is calculated according to the degree of work intensity and agreement in advance. Služby tepovania, upratovania a parného čistenia vykonáva v Martine spoločnosť TEPUJEM.SK s.r.o, Nemocničná 20, 990 01 Veľký Krtíš, IČO: 47061197, DIČ:2023741621.